Did you know that more than half the brain is devoted to processing sensory experience, and much of that sensory receptivity focuses on touch? The brain, a 3-lb wet computer, is constantly processing incoming data from the senses. And like all good computers, the brain consumes more than one fourth of the body’s energy resources. Although you have touch receptors all over your body they are not distributed equally. Your hands are some of the most metabolically expensive real estate on your body. So why have our hands taken so much of our brain’s real estate? Scientists, philosophers and other students of the human experience say that the hand is an extension of the mind. Or more succinctly, as Immanuel Kant posited, “the hand is the visible part of the brain.” For communicators hands are also devices through which others receive our transmissions and they color messages in ways we’d do well to understand. Our hands are skilled communication tools. This video, the first of six I want to share with you, introduces haptics and the neuroscience of touch. The video features Dr. David Eagleman, host of the PBS seriesThe Brain, who will walk us through the complex science of haptics and help us understand how touch can color our interpretation of information. Here is Neuroscience Vid. 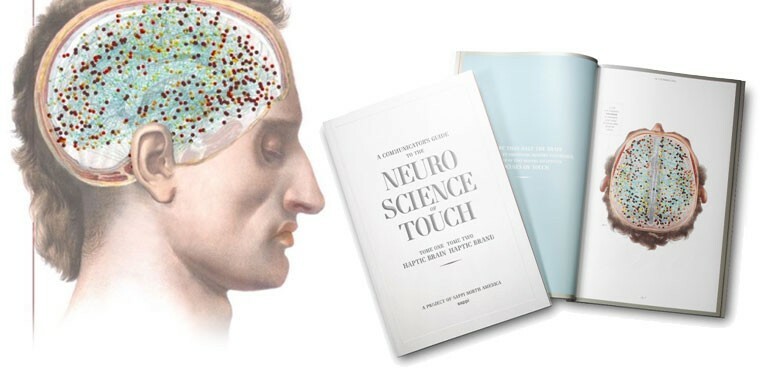 1, The Neuroscience of Touch, an introduction to haptics. Want a copy of Haptic Brain, Haptic Brand: A Communicator’s Guide to the Neuroscience of Touch? Get one here. As Sappi etc.’s Print & Creative Manager, Daniel Dejan provides consulting, training and education for the print, paper and creative communities. Daniel is aCertified G7 Expert with a proficiency in Color and Color Management. Daniel will help us understand this critical yet overlook communication device at the re:think design conference. Held on June 9 at the Midway in San Francisco in conjunction with AIGA’s SF Design Week.